Our Practitioners have the ability to see clearly to gain information you seek, beyond the typical human senses. This is not a form or use of telepathy; it is more of a being in tune with the Universe and learning what to listen to in order to unlock or discover the path that leads to the answers sought. Every Practitioner has a different way of opening their gifts and using them to find your answers. While many sessions may seem the same, they are never exactly alike. There are many factors which can attribute the ease or difficulty in finding the answer you seek, eventually it will be uncovered. 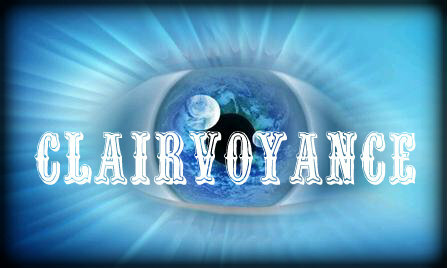 Clairvoyance uses the Third Eye or sixth chakra and to “see” your answers and the solutions they bring. A good practice to increase the speed and effectiveness of your readings is to use our Chakra Tools to balance the Third Eye, and others, allowing the energy to flow more freely and give a clearer picture to our Practitioners. Clairvoyance is a part of the human evolution, part of yours, mine, and everyone’s DNA. The unlocking of the potential to be a clear seer is truly up the amount of listening, effort and openness one is willing to give to the Universe. Our Practitioners have many decades of experience in reading and foreseeing through the use of tools such as Clairvoyance, Cards and Auras.